Don’t go to another class that leaves you with a little more knowledge but no comprehension on how to put it in action. This seminar is not a typical class format. We will actively explore leadership styles and apply them in real time. The exercises will highlight your leadership style and behaviors. At the end of the seminar, you will create strategies and plans of how to further incorporate new skills into your leadership toolkit. Become a leader at your job today. 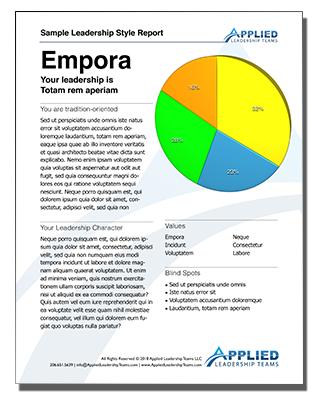 Assess your leadership style using a proven, simple and powerful tool based on the work of Carl Jung. Compare your dominant leadership and communication styles to others. Learn to flex your leadership behaviors and motivate others with differing leadership styles. The result of the program is an improved ability to lead from your strength and a practical knowledge of how to motivate and communicate with others more effectively. When your team attends they learn how to work more productively with one another by utilizing each other’s strengths. JP facilitates fun, engaging and relevant workshops. All learning activities are customized and specific to you. Participants leave the workshop already working toward their leadership goals. After the workshop, a representative follows up with you to answer questions and keep the momentum going. Single or multi-day training for teams is delivered “onsite” or an offsite venue of your choosing. Typical venues include meeting rooms, conference spaces, retreat centers and via webinar. Standard group size varies from 6 – 55 participants. Accommodations can be made for larger groups. 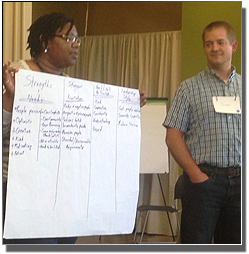 Training for individuals offered twice a year at workspaces in the Greater Seattle Area. Contact us to learn more about enrolling in a class or organizing a workshop for your team.